Short ribs cut thinly across the bones. Marinate before grilling to maximize their tenderness. 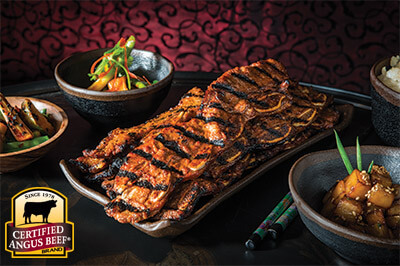 A tangy Kalbi style marinade makes thin cross-cut short ribs incredibly tender and full of flavor. 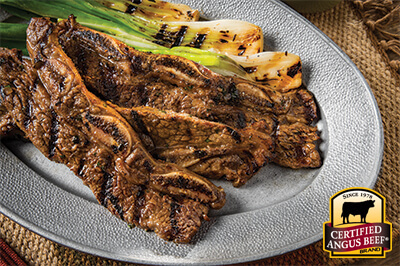 Grill the marinated short ribs for caramelized, juicy perfection. In a medium mixing bowl combine soy sauce, vinegar and oil. Whisk in honey, garlic, ginger and scallions. Place short ribs in a zipper-locking plastic bag. Add all but 1/4 cup of marinade, turning ribs to coat fully in the marinade; seal the plastic bag. Marinate overnight, or for a minimum of 10 hours. Preheat grill. Warm reserved marinade in small saucepan. Remove short ribs from marinade, discarding leftover liquid. In batches, sear short ribs in a single layer (as you would with bacon) 1 to 2 minutes per side until slightly charred, basting with reserved marinade. Transfer to a serving platter, rest 5 minutes and sprinkle with sea salt and optional garnishes.